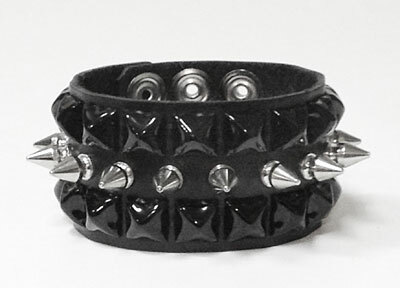 Description Rock out in this awesome wristband featuring two rows of black pyramid studs and one row of black 1/2" spikes in the middle on 100% black leather. Made locally just for us from high quality thick leather so you know it isn't some mallstore cheapo, it will last for life! The double snap closures adjust to fit wrists from 5 1/2" to 7 1/2" around.